Shivatîr-î Zrêhbârân are the elite of the landed nobility. Trained to fight as heavy cavalry. The combination of lance and bow make them a very powerful and versatile force. 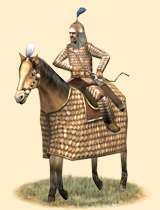 These were the elite of the Parthian kingdom being a unique, highly trained, maneuverable, hard-hitting, heavy cavalry. The use of skirmishing and rapid maneuvers by the shock cavalry became important elements of Parthian battles and the Zradha Shivatir are masters at this. The Zradha Shivatir are heavily armoured and equipped with lance and bow. This allows them to engage the enemy from afar before making a final charge. These men use concentrated missile fire combined with the mass charge of cavalry to break the will of enemy infantry. Against steady infantry they will employ skirmish tactics peppering the enemy with archery, wheeling away if contact looms, only to rally again as often as might be needed. They would have an iron 'spangenhelm' helmet with mail aventail. An iron scale corselet would protect the torso, partially covered by a richly embroidered felt tabard. Laminated arm guards would completely encase the arms, from shoulder to wrist. Leather gauntlets without reinforcement would be worn to protect the hands, leaving them free to ply their bows. Thigh guards and leg defenses of laminated armour attached to quilted cuisses secured to the belt with leather thongs. The horse’s tail would be tied off with a brightly coloured ribbon. He would sit on a large brightly coloured saddle cloth which would be heavily embroidered with geometric designs or animal motifs. They would be armed with the 12' kontos lance and the powerful composite horse bow. A light brown open quiver would be slung on the right side and a separate bow case slung on the left. Historically, Roman commanders expected to win their battles with a decisive infantry clash. The Parthians however did not accommodate them. The use of skirmishing and rapid maneuvers by the shock cavalry became important elements of Parthian battlefield tactics and the Zradha Shivatir were masters at this. The name Zradha Shivatir, means armoured bowbearers.